“McFarland, USA” is a film that should be busting records this weekend but will probably be lucky to even make it in the top 5 grossing films. Based on a true story, showing the real people at the end, the reel people do an excellent job holding your interest in what is a formula movie where you know it is heading, including who will ‘save the day’. Directed by Niki Caro and a story and screenplay by Christopher Cleveland and Bettina Gilios, will put a smile on your lips and occasional tears to the eyes not by any manipulation but just presenting what happened. About half way through the movie, from the scene where poor boys who have never seen the ocean dive in with pure joy until the fade out you will be moved. We are taken to the real town of Mcfarland, California, where the population are mainly poor Mexican-Americans and teenagers are lucky just to graduate high school. The most they can see of their life is picking vegetables and fruits, not getting paid by the hour or pound but by the field, to help their family. Having recently been fired from his job for being too rough with a student Jim White (Kevin Costner) and his wife (Maria Bello), teenage daughter (Morgan Saylor) and preteen (Elsie Fisher) finds themselves fish out of water in McFarland where you don’t find hamburgers but tacos, neighbors present you with a live chicken as a welcome present and not only explain what a Quinceanera is but make one for the teenager as she celebrates her 15 birthday. White, of course, is made fun of not only for his name but his not understanding what people who are different from him go through just to make it to the next day. Talking the principal (Valente Rodriguez) into letting him start a cross country running team, after seeing a couple of the boys run, not knowing anything about coaching runners you know where the picture is going even if you aren’t aware of the true outcome. Never having been a fan of Costner’s in the sense I had to go see his pictures I will say after seeing him last month in “Black & White” and now in this one I am definitely a fan of his. All the adult performers, including the mother of 3 boys who are runners, and who live next door, played by Diana Maria Riva, are excellent but it is the boys: Ramiro Rodriguez, Carlos Pratts, Hector Duran, Sergio Avelar, Rafael Martinez, Johnny Ortiz and Michael Aguero that are the backbone of the movie. 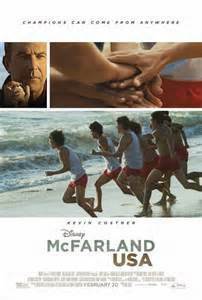 “McFarland, USA” is a must see movie if you like upbeat, moving, feel good, get your pulse going and leaving with a smile on your face movies.